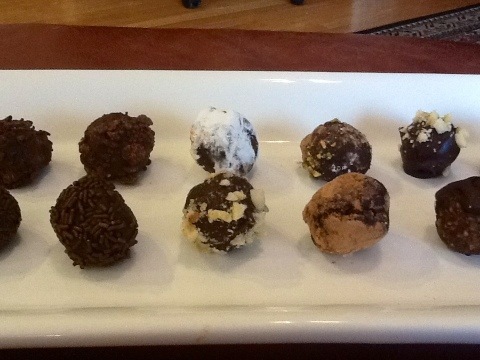 The idea to make homemade truffles began with my latest place for culinary inspiration – Pinterest. If anyone needs an invite, let me know in a comment and give me your email address if I don’t have it. 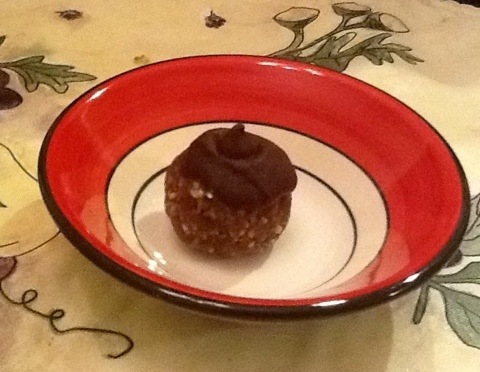 I was drooling over Paleo desserts and came across Healthy chocolates, truffles and raw cookies on the Damy Health blog. 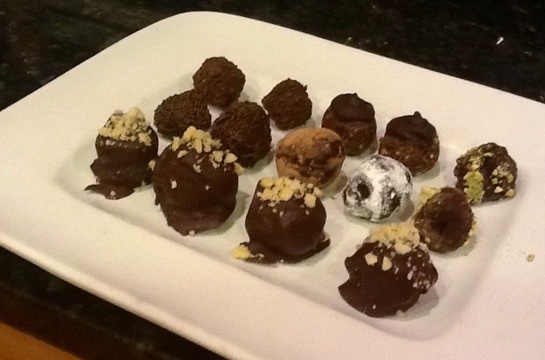 I decided that it would be fun to make truffles with the girls on Friday when they were out of school. Dora absolutely lit up when I brought up the idea of homemade truffles, but her face fell when I showed her the healthy, date-based recipes I had found. 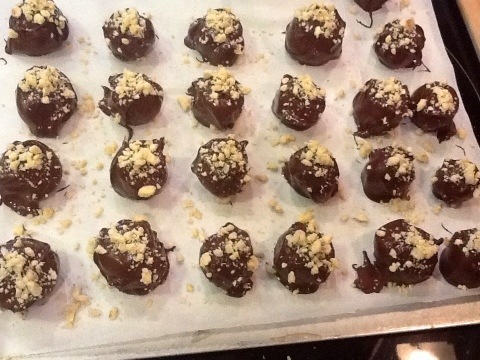 So I told her we would make some decadent truffles as well. After reading through pages of comments to classic truffle recipes on Epicurious, I realized that truffles were considered to be difficult to make. Crap! 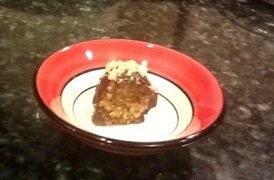 All the talk of tempering chocolate and breaking ganache was completely over my head. I don’t cook fussy things. I won’t even bake a layer cake (not worth the effort). The healthy recipes I had found were of the level of “throw everything in the food processor and roll into balls.” But I was committed now. I found a couple classic recipes that I thought I could manage and hoped for the best. Melt dark chocolate chips in a double boiler. Add almond flour, unsweetened coconut and ground flax to your food processor and pulse until blended. 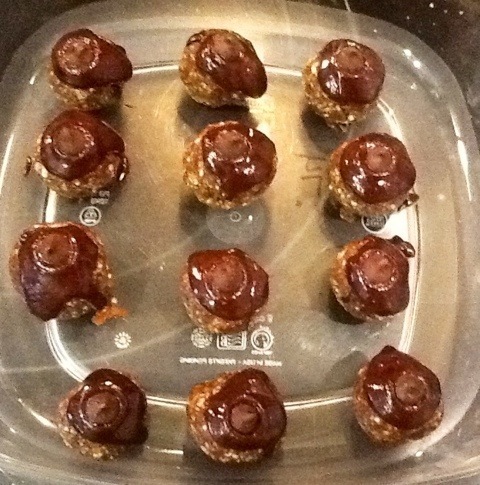 Add the vanilla extract, almond butter, dates, and water. Blend until cookie dough texture. Remove the dough from the food processor and place in a bowl. Refrigerate for several hours until firm. Begin rolling into 1 inch balls. 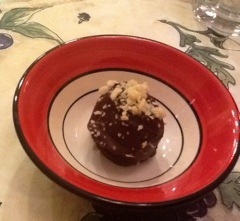 Using 2 spoons, cover balls with melted chocolate individually. 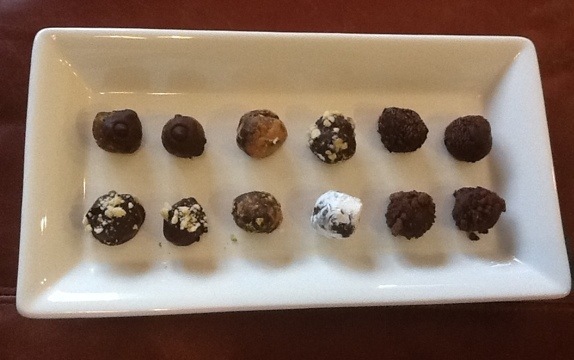 Place chocolate covered balls spaced out on a waxed paper covered tray and sprinkle with your topping of choice. We used crushed hazelnuts. Place in the freezer for a few hours or over night. Using your large food processor bowl and blade process all ingredients until dough like consistency with visible chunks of nut. 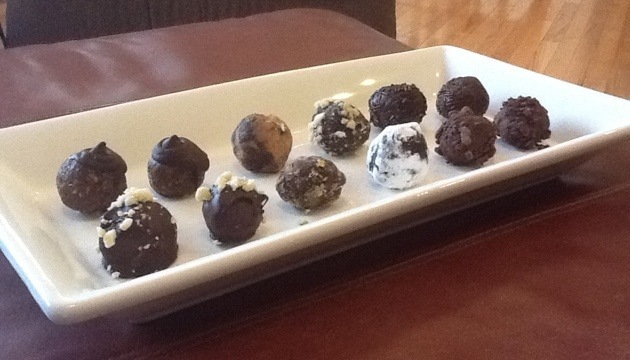 Roll into cookie dough balls. Jewel sampled a piece of truffle and exclaimed, “you known what would make this better? Bourbon!” Yes, she’s definitely my daughter… So I deglazed the double boiler that had the leftover chocolate from the previous recipe with bourbon, and we used that to top the Pecan Pie Cookies. We also had a few chocolate chips left, so we gave the truffles little chocolate chip hats! 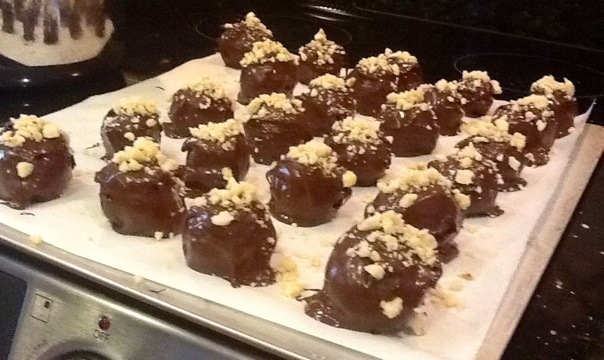 Our next project was Rum Balls. Jewel and I made the dough, and Dora and her friend Mackenzie made the balls and rolled them in chocolate sprinkles. At some point I also made Easy Chocolate Truffles (although I have no clear recollection of this) and Dora and Mackenzie also made this dough into truffles. Neither of these last 2 recipes are Paleo. Ok, I guess you can’t tell much from that picture. 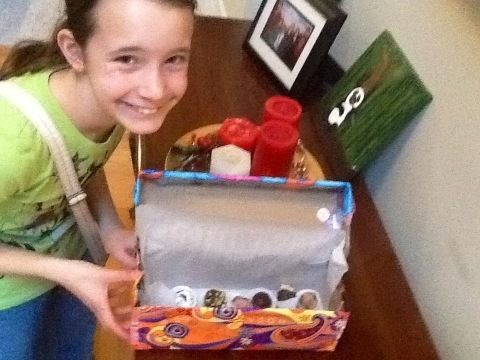 That’s Mackenzie with her box of truffles to take home. Her decorated box. I used more than one type of wrapping paper. The girls just kept handing me pieces of tape. Next thing you know, I’ll be scrap booking! Stay tuned for tomorrow’s episode, in which I not only make more truffles, I decorate more boxes.